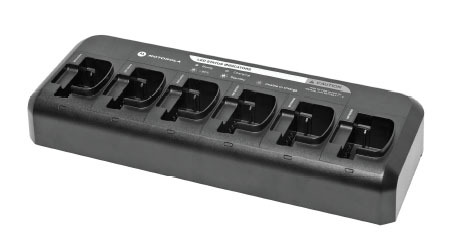 New Motorola NNTN8353 Six Unit Charger Saves Desk Space | Magnum Electronics, Inc.
Motorola announced the new NNTN8353 120V AC multi-unit charger for the CP150, CP200, CP200 XLS, and PR400 portable radios. The new charger’s footprint at 6″ H x 17.5″ W x 11.5″ D will save desk space or it can be mounted with the optional NLN7967A wall kit. It will charge batteries attached to radios and/or spares. The recently announced NNTN8353 charger will replace the WPLN4161 multi-unit charger after existing inventory is depleted. The WPLN4161 used single round charger pockets in a heavy steel shell. The older charger could not be wall mounted and and used an external 120V AC power supply. The NNTN8353 is compatible with the Motorola standard high-capacity NNTN4497 (2,190 mAh) and slim NNTN4970 (1,600 mAh) Li-ion batteries that are lighter and provide longer talk time. NiHM battery types including the PR400 NNTN4852 FM Approved Intrinsically-safe battery will rapid charge in 2-3 hours. The charger is also compatible with the NNTN4496 NiCD batteries that were recently discontinued. Update 12/11/2013 – The NNTN8353 was cancelled with the introduction of the new digital MOTOTRBO CP200d DMR radio. It has been replaced by the PMLN6588 six pocket charger that has a smaller footprint and lower price. This entry was posted in Motorola, New Products, Portable Radios and tagged Charger, CP200, NNTN4497, NNTN4852, NNTN4970, NNTN8353, PR400 by magnumelectronics. Bookmark the permalink.